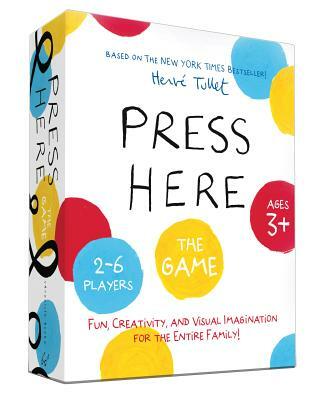 The magic of the New York Times bestseller Press Here is now available in game form! Hervé Tullet has reimagined his groundbreaking book in an entirely new dimension. Players take turns completing color sequences by placing red, blue, and yellow playing pieces on one of twenty-five fabulously designed game boards. What seems like a simple choice is likely to lead to animated discussion as players come to understand the visual logic at the heart of the game. With two levels of play to choose from—so that it's easy enough for a toddler to grasp, but also complex enough to challenge older siblings and adults—this engaging game delivers hours of entertainment for the whole family. Hervé Tullet is known for his prodigious versatility, from directing ad campaigns to designing fabric for Hermès. But his real love is working with children, for whom he has published dozens of books, including Press Here. He lives in Paris, France.